Stargate is one of those magic machines that are different. First, it's a modern DMD game not by Williams or Bally, who had the big name in the 90s. It was made by Gottlieb and they were certainly not famous for making great games in the 90s. Gottlieb was a big company in the electro-mechanical pinball time, but they quickly lost their high status when it came to solid state electronics. As you might recall, the only Gottlieb game I had so far was Arena and that one was really not very much to talk about. Not so with Stargate. 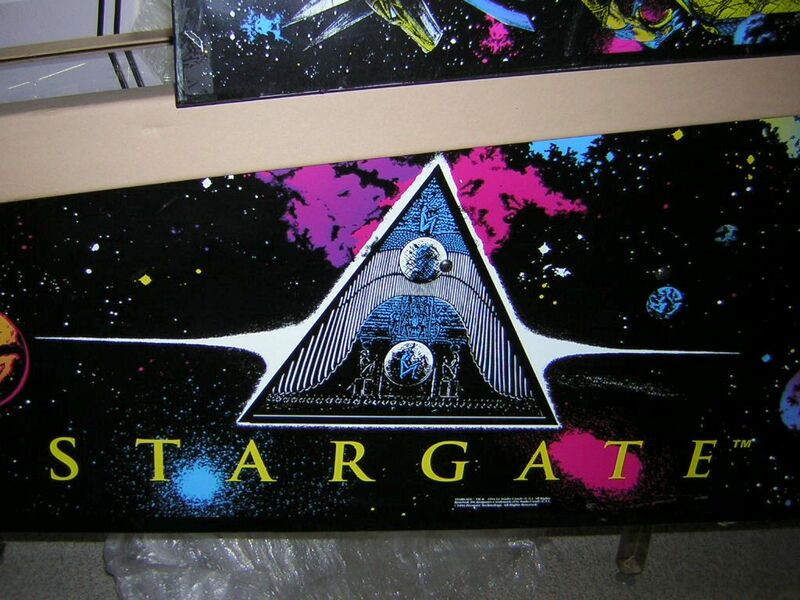 I had one play on it before I purchased my first "real" pinball game, The Machine, and I was so hooked from that first play, I was sure to own a Stargate "one day" when I was ready for it. This moment is now, and it couldn't be better. For a lot of money I got a lot of entertainment, and I don't regret any bit of it! 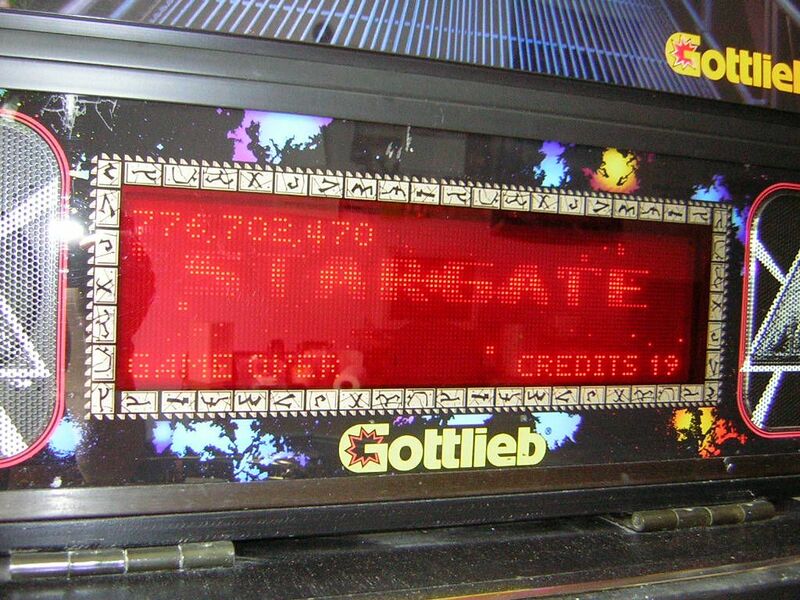 If there is one great solid state machine that Gottlieb made, it's Stargate. It has incredibly fast-paced gameplay, non-stop multiball, two wizard modes, spectacular light and flasher effects, a very detailed playfield, player-directed speech and nice sound effects, although the music is not as great as DCS would be. It's an action entertainment package worth every minute of play. I wanted a Stargate so many times, but I never had the money, plus I was still unsure whether it would indeed be right for me to get this machine before some others - after all, Gottlieb technology is different from Williams and if something breaks, you're left to wonder. The problem also was that there were still a few things which distracted me from the good points of the machine: the music really isn't all that great and seems unnerving when you hear it the first few games. I learned by now that the music can sound quite attractive and fitting to many modes when you just play long enough and get used to it. But the fact remains that the sound in Gottlieb's System 3 is not at all a concurrent to Wlliams' Digitally Compressed Sound System used for most of their DMD games, and some other things on Gottlieb games were always behind the times. I first noticed this with Arena which had a very odd sound system, very lame gameplay, alpha-numeric displays which didn't display alphanumeric content, very out-of-the-ordinary switches and electronics, and whatnot. On Stargate, some of the technology is a little old, but the game still manages to bring a very modern game to you with features you cannot find on Williams/Bally games. We'll look into them on this page in detail, since detail is what lifts Stargate's playfield up a level from the others! In the past weeks I said goodbye to my remaining System 11 games, Black Knight 2000 and Diner, because I wanted more gameplay depth and more action with a new DMD game. I bought STTNG almost two months ago and finally had it working two or three weeks ago, but while this satisfied my modern gameplay thirst, it also meant coma to the System 11 machines which were now left untouched for quite a while. Realizing this and noticing that I was indeed moving in the right direction with STTNG, I decided to sell the two Sys11 beauties (which they are, especially Diner) and "trade" them for another complex DMD game, and this was when I said to myself that Stargate would be the best choice. To underline this, I read the game rules on the Internet to verify the complexity of gameplay I was searching for, and compared to the other two machines I could have bought with my money (No Fear and Johnny Mnemonic), Stargate was the most complex and feature-rich machine. Now the only problem was finding one in working condition. 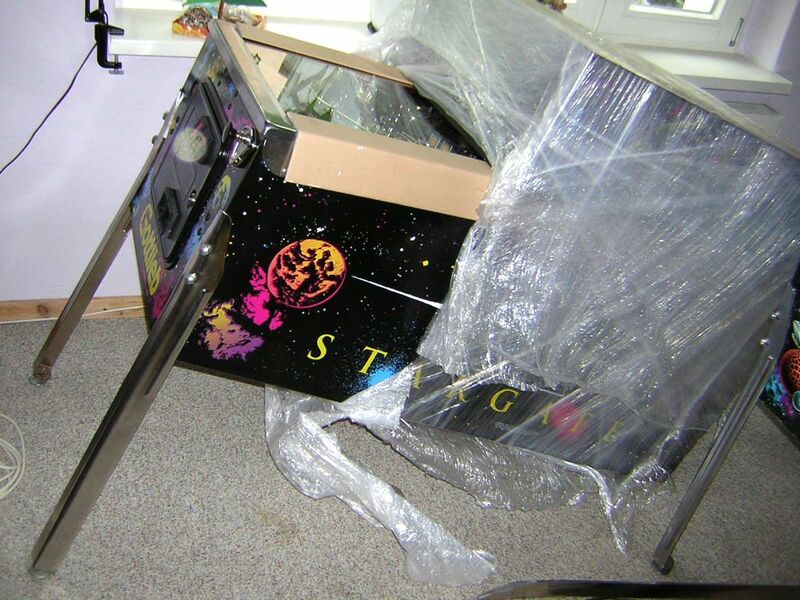 When I had the two Sys11 games sold and received additional money for free use, I walked into the Pinball Network forum only to find that there was a Stargate in dream condition on sale for almost a four-digit price. 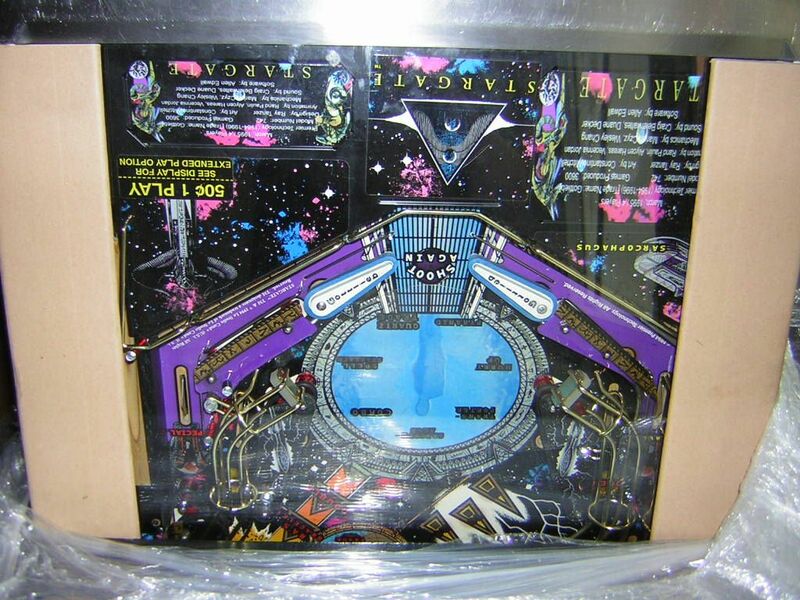 950 was a deal a little higher than the standard prices for Stargates, but for the condition the game was in, you couldn't ask. I instantly messaged the seller and by the afternoon I had a positive reply. In a matter of days, the machine was packaged up and shipped here where it arrived two days ago. So now I had another game to unpack like it was Xmas! The machine was moved into my room with the guy from the shipping company and there it stood. Now, I had made an arrangement with two friends to call them and they would help me set it up, but since the game arrived even before noon, I couldn't do that - I was forced to set it up alone. I had done it once with BK2000, but the memories of that day still bring me head- and back-aches. Stargate weighs roughly 130 kg and setting it up alone was a challenge, but on the other hand I didn't want to wait, so I just did it. Surprisingly it only took me half an hour to remove the vital parts and attach the legs, then another fifteen minutes to move the game in place. When I freed the upper part of the body from the packaging material, I noticed that the backbox (and cabinet) looked extremely good, almost like new. This is one thing that justifies the high price! And once the machine was in place, the backbox was folded up and I looked Ra directly in his eyes! Also, seeing the upper playfield for the first time in daylight (the Stargate I played one year ago stood in a dark room) with the pyramid, the gold metal ramps, the gold wire-form guides, the detailed plastics and the mylar in excellent condition was a remarkable moment. The first difference you notice when you are used to Williams DMD games is the ball flow. Stargate kicks and bounces the ball around all the time with its kicking targets, devices which kick the ball away like a slingshot but can be shot like normal standup targets! Because the whole playfield is filled with them, plus two bumpers, the fast slingshots, and the extremely steep metal ramps, the gameplay is very ran-dom and very fast. Aiming is a lot different from most games because the shots are very narrow and need to be hit with great precision to be successful. The pyramid in the far center is the trademark shot of Stargate because this is where the modes are started and a lot of key sequences end, however this shot is very tough to do if you're new to Stargate (I remember that I was never able to really do it in-tentionally one year ago), and even after becoming acquainted with the flow, it's still a shot to be mastered. Since Stargate's playfield is full of stuff and very narrow in essence, it's even more difficult to hit those shots than it would be on a broader playfield. Then there are the flippers - there is no Fliptronics here, the flipper assem-blies work like normal Williams System 11 / early WPC flippers, have an im-portant EOS switch, analogue contacts on the flipper buttons, and the right button has two contact points for the lower and upper right flipper. On my machine these two contact points are quite separate from each other which means you have to press the button half-way to activate the lower flipper, but full-way for the upper flipper. The buttons are very hard and pressing them takes some punch. After the first day of Stargate gaming, my fingers hurt a bit from that! I suspect that the difference between STTNG's Fliptronics flipper buttons, which are very light to press, and Stargate's tough buttons just takes some time for my fingers to switch over. What the flippers on Stargate do best is flip at full power, and they have to do that because the game requires very strong flippers especially for the ramps (which are still difficult to complete). It's amazing how the small flipper coils can be so powerful! When you press the flipper button, you feel the vibration of the plunger slamming into the coil stop, but the sound is very different from Williams games; it's not the satisfying deep knock, but a lighter metallic bump; it's hard to tell just how much force these flippers have. When you flip the ball away at the right angle, they can give it some pretty serious speed which will hopefully be enough to clear those ramps - but 50% of the time it isn't. I said that Stargate's playfield has a lot of detail and indeed it's remarkable how much work the designers put into the game to recreate the sci-fi/fantasy desert world the movie is set in. 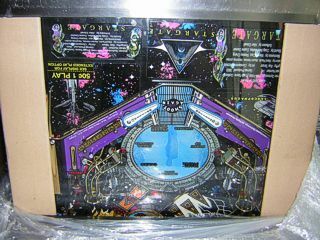 A glance at the upper playfield makes you look twice because it doesn't look like a normal pinball playfield, but more like a mini world the ball travels in. 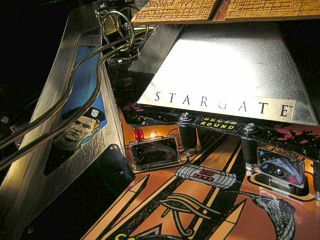 While other pinball machines have fairly pri-mitive decoration on their playfields because it's after all just a pinball game, Stargate tries to be more than a board with a ball to roll on. Sure, STTNG has four ship models on its playfield which look very nice, but compared to the solid green Romulan Warbird, the Horus structures on Stargate are many levels above! While made of plastic, they look like metal because of the rea-listic painting and there is a lot of carving made into them so that every geo-metric detail from the film figures is accurately reproduced. 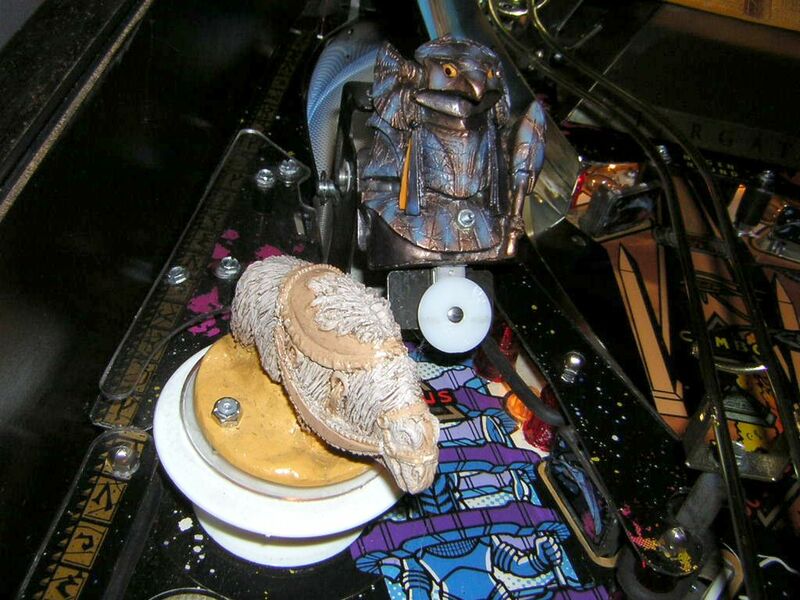 The same goes for the two animals sitting on the bumpers (do these things have names in the film?) which could be sold as part of a miniature zoo collection. I bet that if any of these plastic models were ever damaged, they wouldn't be reprodu-cible. The pyramid model on top of the playfield resembles the big pyramid where Daniel and the military team arrive after going through the stargate. 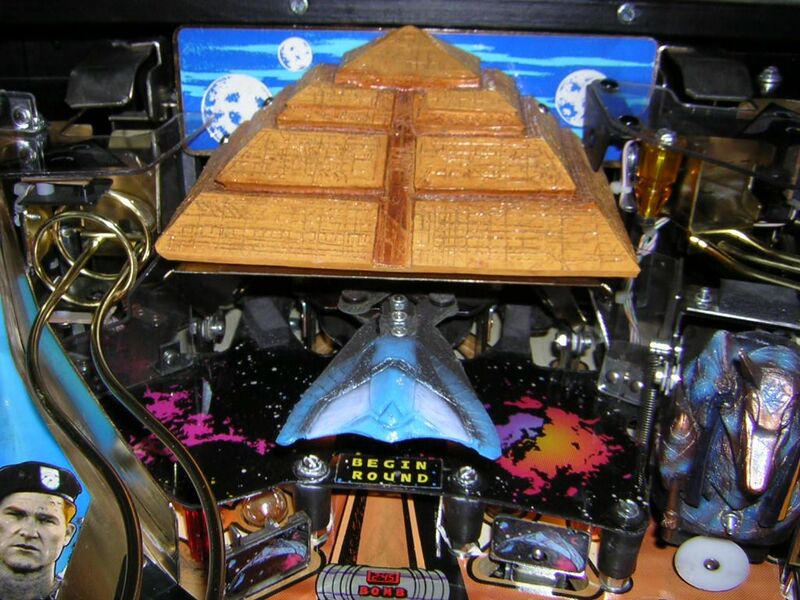 Like in the movie, this pyramid plays a key role in the game and - which is the coolest feature - it can open the lower portion just like the real thing to reveal a model of the glidercraft used to stop the rebellion in the film, and this glidercraft moves to the left and right on a pivoting arm! 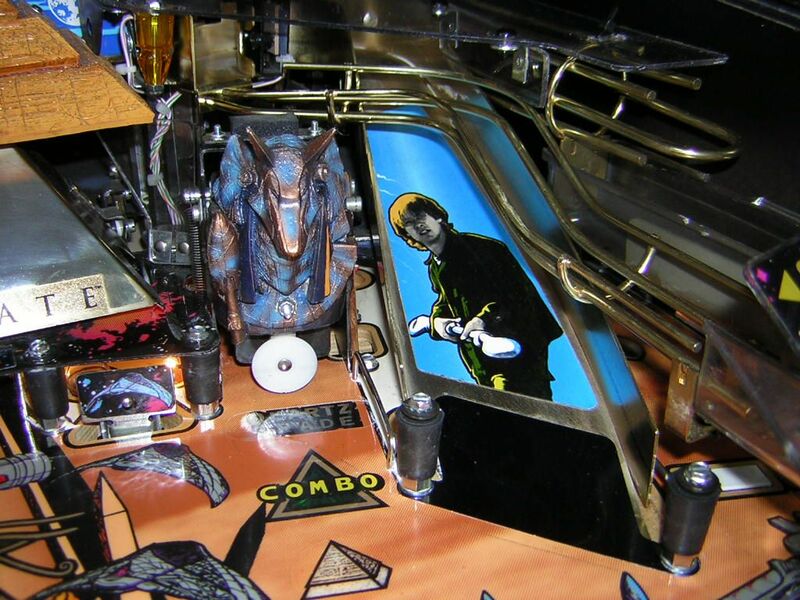 You haven't seen this on any other pinball machine and while it looks awkward when played in daylight (because it's simply a toy moving to the left and right, woohoo), the flasher effects on top of it are extremely cool when played at night. It's a very nice idea to make you go "wow" the first time you see it. To ensure that really everybody gets to see this toy, the Glidercraft mode is started automatically on the final ball if it hasn't been started by the player before (of course this can be changed in the options). 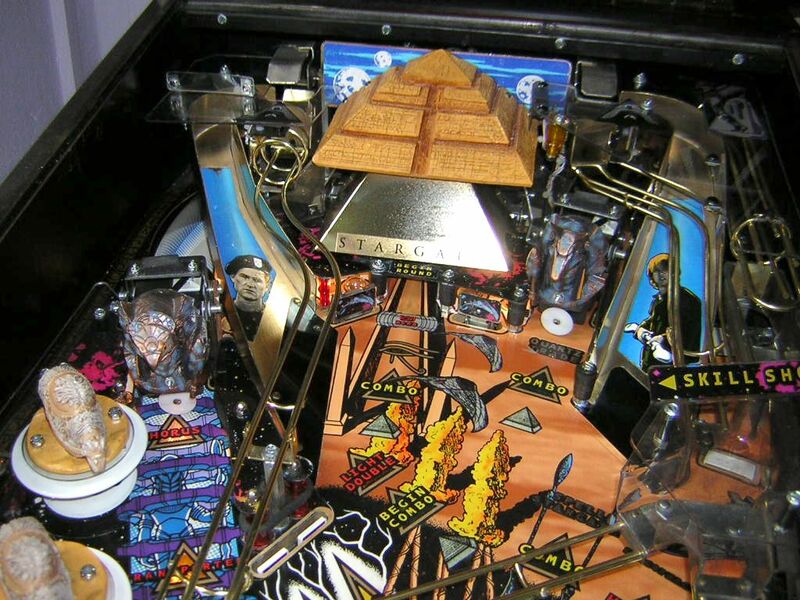 The playfield is set up to look very crowded and feature-rich, which it is - drop targets, kicking targets, Horus targets (explanation later), bumpers, ramps, three flippers, two lanes behind the Horus targets, the pyramid and the Sarcophagus are a lot to look at. To make sure the ball gets where it's required, there are gold wireform guides above the playfield in a rather freehand fashion, and on my machine these wireforms look absolutely beautiful - no scratches or corrosion anywhere, of course a little used from the ten years of operation, but nonetheless very impressive. Add the gold ramps and the gold-coloured lower "metal" part of the pyramid and the machine looks very metallic and precious during the day, a very nice touch and a definite eyecatcher. But while Stargate might look beautiful at daytime, it's even more impressive when played at night! It's the first pinball game I had since The Machine with bright white GI lighting (all others had a yellowish GI) and extremely bright flasher effects. The coolest thing is that these flashers are not simply turned on and off, but when you enter a meaningful mode like Stargate Multiball, they "circle" smoothly around the playfield fading in and out like normal lamps, but very bright and very impressive! They light up the playfield so much that it becomes almost as brightly lit as in daylight. In standard play, every hit to and from a kicking target triggers a short flash behind it, and when the glidercraft comes out of the pyramid, the flashers above it accompany the mode with a fast disco-like light show. The backglass is very nicely lit as well. Firstly, there are the normal lamps behind the translite which give the threatening flashes around the stargate their vivid colour. Secondly, the rails on the left and right of the way into the gate have flashers behind them cycling periodically in attract mode with the single flasher behind the sarcophagus of Ra in the center. 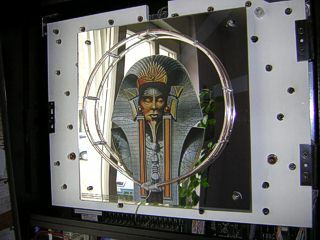 This sarcophagus is a single sheet attached to a mirror (see the photo) behind the actual backglass which not only mirrors the environment, but also creates the same tunnel of lights seen on Xenon and Space Invaders: it mirrors a circle of lights back and forth between the backglass and the mirror itself, adding infinite depth to the stargate to look like there was something behind it. And to top it off, there is a very slick "alien signal light" effect behind the mirror which I haven't technically figured out yet! It cycles five or six light stripes in a circular arrangement, similar to what you see in big cities when a club advertises itself by sending light signals into the sky. It's hard to show with a digital camera (as is the whole lighting of the machine; I cannot take good photos of it), so you can only take my word for it. Right now as I'm writing this, I look directly into the mirrored sunlight emanating from the metal pyramid, and it blinds my eye! Hehe. Acoustically, Stargate is a mixed bag... I would give the audio a solid 7 if I were to rate it out of 10, especially for the good sound effects and speech. As I wrote above, the music isn't all that great, though. You learn to like it after a while, but the first impression reminded me of the "good old times" of DOS games with FM synthesized MIDI music, only that the synthesizer in Stargate is extremely bland. 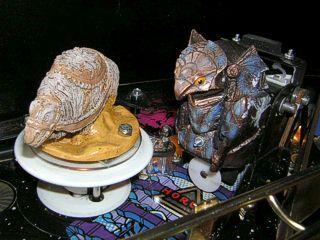 About three or four sounds can be heard in the music, that's it - there is no real drumming except for one or two tracks, the melodies are shaped with the same monotonous peeping sound, and you are missing the heroic kind of the film's score - the music in the pinball game is apparently custom and while some of the melodic ideas fit the theme, it just can't stand up as a score for a game based on a movie, mainly because it's simply too shallow sounding. 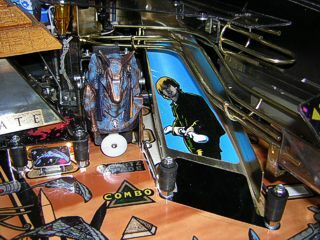 The sound effects include flashes, weapon sounds, "moving wall" sounds, the voices of Ra, his guards and of course the tutorial speech by James Spader who sounds much more excited here than in the movie, however his speech is completely customized to the pinball game and there are no speech samples taken from the movie like on Terminator 2 or STTNG. If you just flail around and don't shoot anything particular, he will occasionally tell you to shoot the pyramid to get you started with a mode, which is probably the most speech you're going to hear if you aren't a good player. It becomes repetitive after a while especially if you're already trying to hit the shot he tells you to go, and it can make you scream "shut up!" because you already know what you have to do. However, the speech can be very helpful and even rewarding if you are inex-perienced with Stargate, and since it's a very fast game with a lot of multiball, I rarely find the time to look at the display to check the instructions or my score. Daniel telling you again and again what to shoot for can make life a lot easier if you have this problem since you won't need to look up to see what you are supposed to be doing, you just listen for instructions. Plus, the speech is very diversive because the machine actually recognizes where the ball is and Daniel tells you to shoot the left or right target depending on the ball's position. The acting seems very good to my ears and is clearly understandable even to foreign players (like me, but I don't have a problem with the language anyway), and the rewards for correct shots sound great. You make a combo and you hear such comments as "way to go! ", "great shot!" or "wow, what a rush!" It fits the fast gameplay very well. As a final note on the design, the DMD is a special thing to discuss because it's different from any other games I've seen. For starters, the DMD itself is nor-mally coloured like any other display, but the speaker/display panel in front of it has a red transparent overlay diving the DMD into deep red colour. While I don't think that red fits the Stargate theme, it's a difference to other displays I've seen. But the best thing about this DMD is the animation. While there isn't a lot of animation going on as opposed to Williams or even Capcom games (I recently started playing the rare Big Bang Bar on Visual Pinball and noticed how fluent and extremely versatile the animation is), the animation you do see at the start of a mode or when taking some good shots is awesome - it's not cartoony or simplified, but the three possible brightness levels on a DMD are used to full extent to create fluent and very threedimensional animation that looks almost photorealistic most of the time. Also, the text displayed in most moments of the game is well animated when transforming from one screen to another. In general, the DMD on Stargate is smooth, detailed and has some of the best animations ever seen. The purchase of Stargate is the first time that I come to check out the tech-nology inside a non-Williams machine. While I was skeptical at first because there aren't many repair guides for Gottlieb systems on the Internet, I also heard that their System 3 is very well built, rarely breaks, and if it does, the error is relatively easily found. When I looked under the playfield for the first time, I noticed that there are printed marks on the wood for every switch and coil that was installed, meaning that you won't have much trouble reassem-bling the game if you took it apart for a playfield exchange or touchup. Also, all of the fuses are located under the playfield in "farms" instead of sitting on the boards in the backbox. 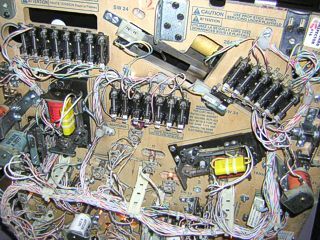 While this is dangerous when working under the playfield with the game turned on (which one shouldn't do unless it's neces-sary), it also makes fuse replacement very easy. On the other hand, vibration to the fuses is greater here and could lead to fuse breakage. The first time I encountered a difference to Williams games was when I opened the coin door after turning the game on for the first time. It switched off! I inspected the two coin door switches and suspected that one of those was the interlock switch used to cut the high power going to the coils just like it's done on Williams games from 1993 onward. It was probably working in the US where my game is from, but since it was switched to 230 volts for European line voltage, this might have led the interlock switch to turn off the whole game instead of the coil voltage... The manual doesn't give more information other than calling the switch "interlock", so I assume it's a bug. To circumvent this, I simply put a few stripes of tape over it to hold the switch permanently closed, otherwise I wouldn't be able to open the coin door even to adjust the volume! Another interesting feature unique to Gottlieb System 3 games are the "smart switches". As stated in the manual, these switches look like normal contact point switches, but they have a beam with a film on it instead of contact points. If this beam is touched by the upper part of the switch, it generates voltage which is sent to the attached circuit board to signal a switch closure (or opening). These switches don't need adjustment and cannot become dirty which is a good thing. Ironically, the rollover switch in the ball shooter lane is not a smart switch and this had consequences when I noticed that the rollover wasn't completely recognized by the system from time to time, and when you shot the ball, either the machine was thinking that the ball was still there, or it "shot the ball itself" before you did it. Either way this led to problems when the automatic plunger was supposed to launch more balls into play in multiball and didn't. I discovered that this traditional contact point switch was way dirty and needed cleaning as well as readjustment. Maybe it's a good thing that the other switches are not like that! Another vital difference is the test mode. You open the coin door and press the only button inside the cabinet that is there to get into the setup menu. Now all you do is change options with the left flipper button and select them with the right. Once you are in the adjustments, you can cycle the options with the test button and change values per option with both flipper buttons. It's con-venient because you don't need to push any more buttons like on Williams games, but it also means you can't cycle backwards, and to save and quit the procedure, you have to reset the game either by turning it off and on or actuating the slam switch. On the other hand, the display gives you infor-mation all the time on what you have to do to get where you want, so you don't need to know the procedure from the manual. Something I discovered in the adjustments were replay percentages which work differently from Williams games: there is a replay "boost" that can be entered in the setup which will increase the replay level after each game where the player has received a replay, i.e. the next game will have a much higher replay value (boosted by the value entered in the setup) so that the same player faces a greater challenge to get the next replay. This boost wears off after this player has completed all his games (used all his credits) and the next player inserting credits will start with the normal replay value for an equal chance. While I don't use replays (and turned off the boost) to award credits to players (I set them to award extra balls which is a little difficult to do on Stargate), it's a very good option for locations where System 3 games are played with money, since it gives every player the same chance to receive a replay, but doesn't keep it that way for the same player. There is also only one option to set Stargate to free play, you have to activate Tournament mode using a switch in the cabinet which enables some options only available to tournaments, including the option to switch to free play. I thought that this option would be my rescue, but the switch doesn't work?! At least I see no options to adjust like it's described in the manual, so I'm forced to enter service credits in the coin door after 20 games have been played. Gameplay is what makes Stargate so unique! As I said already, this machine plays so fast and hectic, you really have to keep your eyes open. Interestingly enough it doesn't seem to be extremely difficult on the other hand; I was able to see both wizard modes on my second day of playing! Just like STTNG, Stargate is not too difficult for me, but it challenges me to come play again because not every game is a good one and there are many ways a game can be started until a direction becomes clear that I follow. I must really have become much better than I was one year ago because when I played Stargate at that time, I couldn't even hold the ball(s) in play longer than one minute. By now I have complete control over the action and this is how I'm able to manage the game not with ease, but with my skill which Stargate and STTNG both align perfectly to - I feel that I need to work to get where I want, but I can do it. It's never boring, but never frustrating either (except when it's a day of drains which occasionally happens). The best fact about Stargate's gameplay is that it feels completely different from Williams, and this means that I'm better off in terms of variety than I would be if I bought another Williams DMD game. While STTNG plays fluent with the loops, long ramps and return paths and the open widebody playfield, Stargate is even narrower than The Machine and has even bouncier gameplay. The flow here comes from the way that the balls travel from being kicked away all the time - you can't say that the ball movement is uncontrollable even if it seems to be at first. After a while, you just know where the balls will go if they are kicked away by one of the targets and you can time your movements with them. 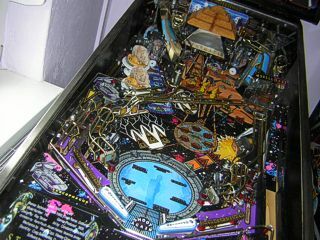 For example, the upper flipper sees a lot more action on Stargate than on STTNG because you can hit the ramp, the two targets before the pyramid and the pyramid itself, and if one of these shots comes back to the flipper, you can instantly punch the ball back again the same direction it came from, and if it doesn't go up the ramp again or hit the pyramid, the kicking target on the left will hit the ball back to the flipper for a third try. It happens in a matter of eyeblinks, but if you can control it, it means very fast and tense action for your right finger! Kicking targets are what make this game so bouncy; they work like a combination of a normal standup target and a slingshot: the target is touched by the ball which presses it backwards and this triggers the coil under it which kicks the target forward like a slingshot kicker arm. The result is that not a single target hit will leave room for you to breathe because the ball comes back to you at great speed after-wards! In the bumper area where only two bumpers do the job, a kicking target is positioned where the third bumper would normally be so that the action can go on even if the ball leaves the two bumpers quickly. Another special target stands on the right in front of the pyramid: this is not a kicking target, but two targets in one with the flat panel being the normal standup target while the pin in the middle is an independent "bullseye" target which scores separately. Yet another unique feature on Stargate are the two Horus targets. Basically they simulate the two guards of Ra from the movie with their high-tech camouflage. Each Horus target can be raised by the machine to allow access to the lane behind it. Raising these targets is possible by running the ball through the inlanes or by shooting the Horus target itself. After the target has been raised, there is a limited time left to shoot for the lane behind it. Cool. Also, there is the Sarcophagus, a special kind of kickback located under the left outlane (where else?) that catches the ball if it comes down here and the gate is open. After a second or so, the kickback plunges the ball back onto the playfield. However, the Sarcophagus can also be entered from the skill shot or the rightmost lane which is covered by a drop target. 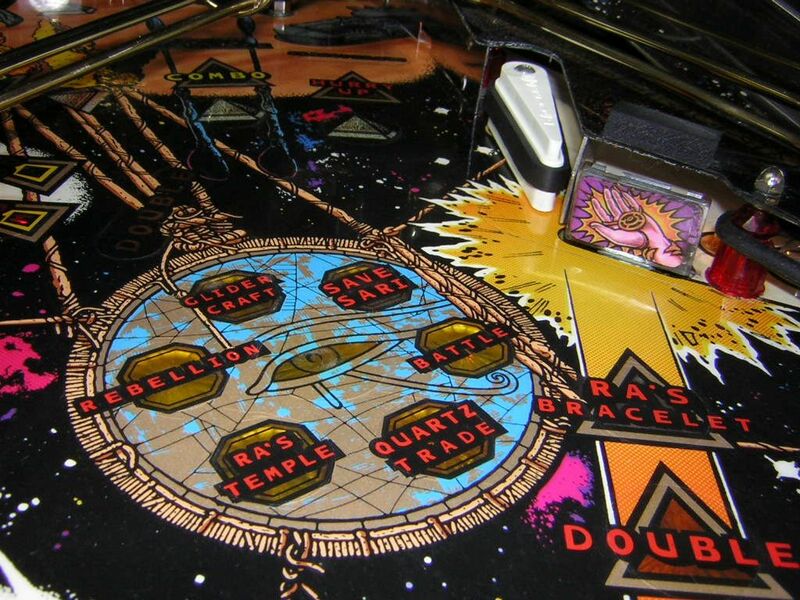 In both cases the ball will move down the wireform guide across the playfield and drop into the Sarcophagus directly which then awards either multiball (very cool if you have just started the game and made a skill shot) or three quartz. Often in the game when you play normally and you knock down the drop target covering the rightmost lane, Daniel will tell you to "enter the Sarcophagus" until either you do it or it times out. And while we're at it, the skill shot is a cool feature too: the plunger which is a normal pull-back device like on older games has very light strength because you must try to plunge the ball just so far that it makes its way up the small ramp and then falls back into the wireform guiding it to the Sarcophagus. If you make it, you get ten million points and the Sarcophagus award. If you blow the skill shot instantly, you can let the ball come to your lower right flipper and then try to shoot the left (open) Horus target directly to make the skill shot from here. Eye of Ra: Four balls are thrown onto the playfield, the maximum number that Stargate can offer. You have three stages you must complete, and after each stage any lost balls will come back for the next stage. Of course, if you lose three of these four balls and only one remains, the mode is over! The goal in this mode is to complete all three stages for super jackpots. 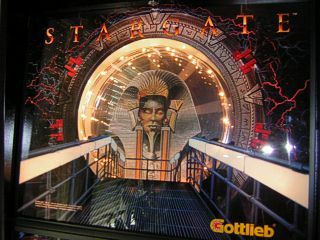 Stargate: Three-ball multiball where almost every shot is lit and you take them for jackpots, then complete the round with a precise shot into the pyramid for super jackpot. Then it starts over. Multiball: Started from the Sarcophagus, two balls are in play at first until you make a jackpot shot which launches a third ball into play. Jackpots are lit three at a time and you have to make six jackpots until you can finish with a super jackpot in the pyramid. The second round starts with only one jackpot lit at a time and ends with a double super jackpot if you can make it. Sandstorm: Started from the Transporter, this mode is not so easy to reach and rewards you with every major shot permanently lit for jackpot until the balls are lost. To get to the Eye of Ra wizard mode, you must start all six modes (missions) displayed around the Eye of Ra lamp insert. Four of these modes (Quartz, Ra's Temple, Rebellion, Glidercraft) are multiball modes. They start with two balls and plunge a third ball into play once you make a correct shot; Ra's Temple even rewards the second shot with yet another ball. The other two modes (Save Sari, Battle) are timed like on other pinball games. Save Sari is actually a hurry-up mode which increases in value for the second shot. Most of the modes are pretty straightforward and require none of the timing and aiming you need for the missions on STTNG. But since many modes have multiball, they are difficult enough to keep for a while. 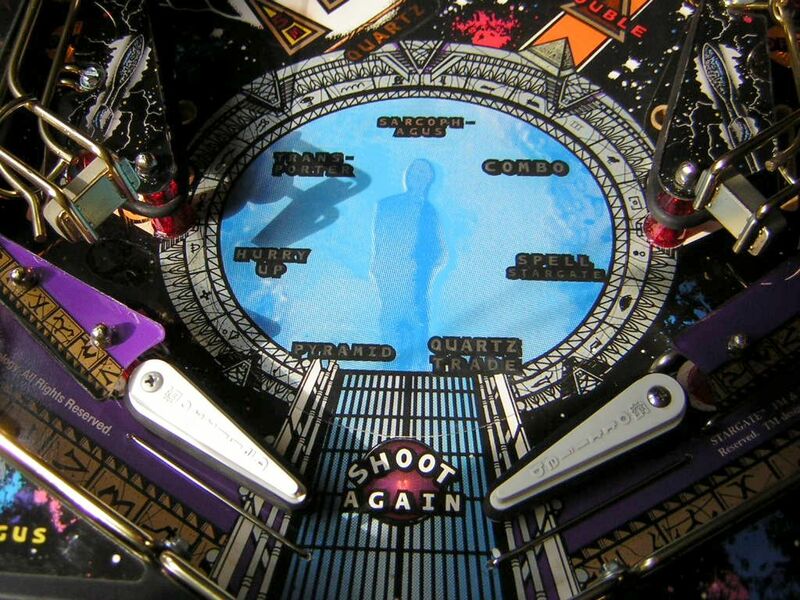 While it's relatively easy to start and end modes (simply let the balls drain in multiball modes) and thus reaching Eye of Ra isn't high art, you have to do a bit more for Stargate Multiball: the stargate displayed above the flippers has seven lamp inserts which turn on after you completed the required task: you have to spell STARGATE on the right ramp, make at least one combo shot, or shoot the right Horus lane to trade your quartz. 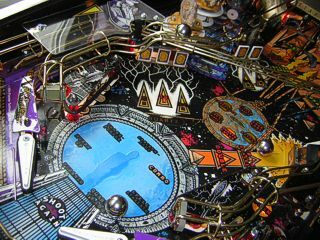 Once all these tasks (Stargate segments) are complete, Stargate Multiball begins. 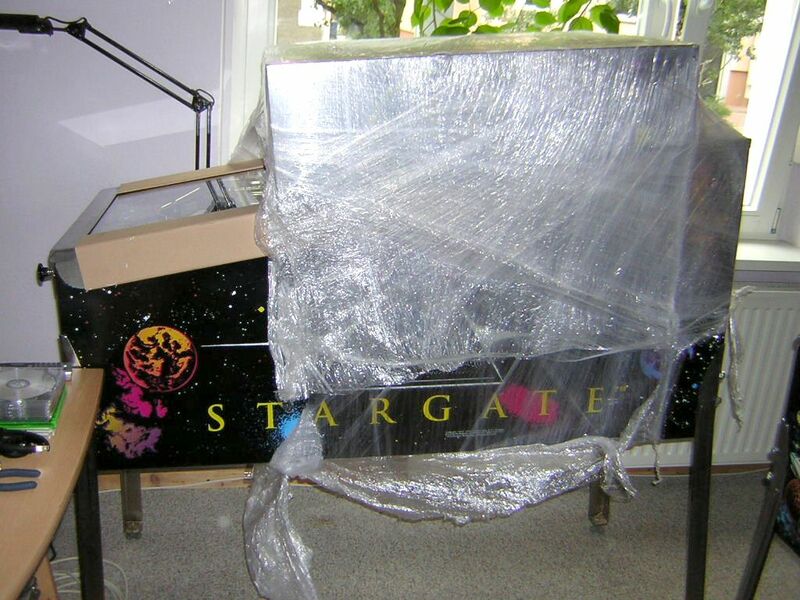 As you can see, Stargate is a true multiball machine. It starts with the first ball skill shot that leads directly into regular multiball. Most of the modes have multiball instead of a timer. 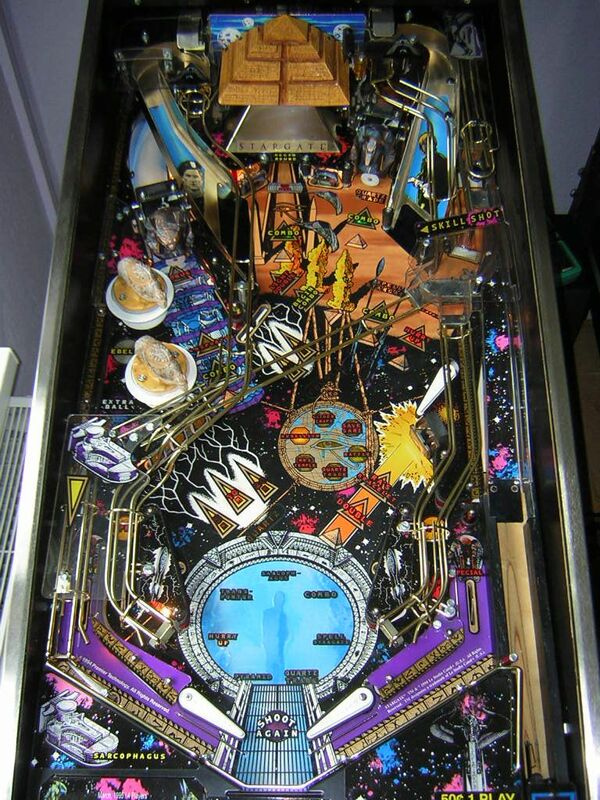 The wizard modes are multiball as well... to cut that short, Stargate rarely leaves you with one ball for a long time, and if you think about the narrow playfield and the kickers, multiball becomes an even greater challenge, and almost permanent multiball... well, is nothing for the faint of heart! After all, this is one of Stargate's greatest gameplay features and if you want to play this machine, you'd better get ready for some serious action. Whenever a multiball starts, the otherwise manual plunger is overridden by an automatic plunger built into the same location. This way you can shoot more balls into play by yourself, but if you wait a second or two, the game does it for you. Other possible shots and awards include the Transporter (which is a Stargate segment) that can be reached by opening the left Horus target and shooting the lane behind it, the bum-pers which start hurry-up on the rightmost lane, combos started by a shot up the left ramp and then followed by the next lit shot (right ramp, left Horus target, right Horus target, pyramid), the drop targets which can be hit in any order for normal points or starting from the leftmost target for five million to the rightmost for 80 (!) million, the Quartz Trade and some more. Acquiring quartz (which is probably the only name they came up with for the mysterious metal found on the alien planet) is done by a number of shots and sequences (for example, spelling STARGATE on the right ramp awards three quartz). 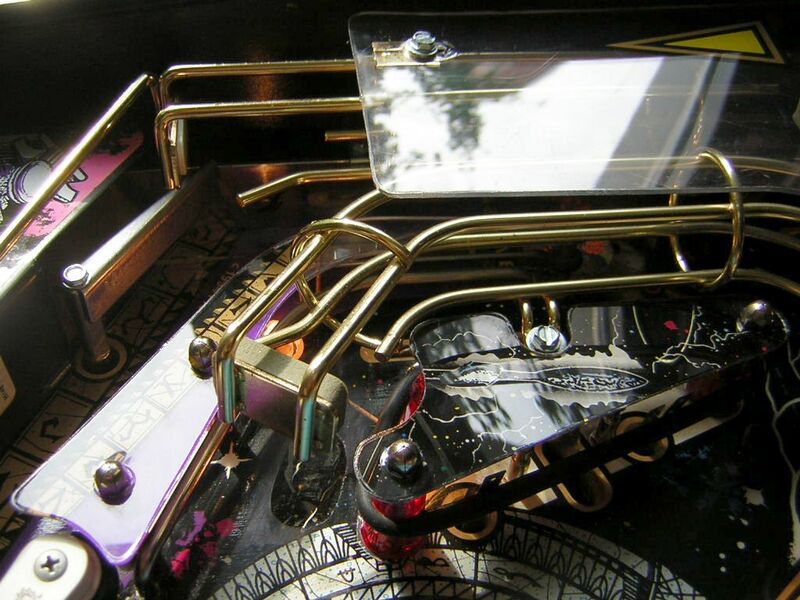 Trading quartz is a way to convert the collected quartz into a pinball award. For example, you can trade one to three quartz for ten million or you don't and keep on collecting, which will give you the option to turn it into more valuable awards the next time you shoot Quartz Trade. The best award you can get for over 25 quartz or so is super jackpot! 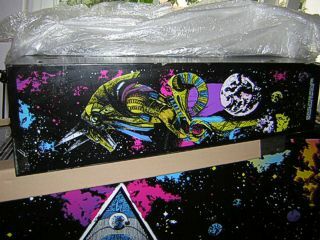 Under the bottom line, Stargate has lots of unique features (kicking targets, Sarcophagus, glidercraft) and rules (modes, multiballs, drop targets, combos, quartz) to warrant a long lifetime in a pinball collction, and even if it isn't the most challenging pinball of all if you just wanna go for the wizard modes (STTNG's Final Frontier is harder to reach and although I can do it, it takes longer), the different flow and bounce of the balls, the feeling of the flippers, the hard ramps and all the minor stuff you can do let you keep playing. It is again the versatility that makes pinball games like this much more enjoyable over a long time, you can come back because you just want to see whether you can do "this" or "that" again. And of course for multiball fans, Stargate is the best choice! 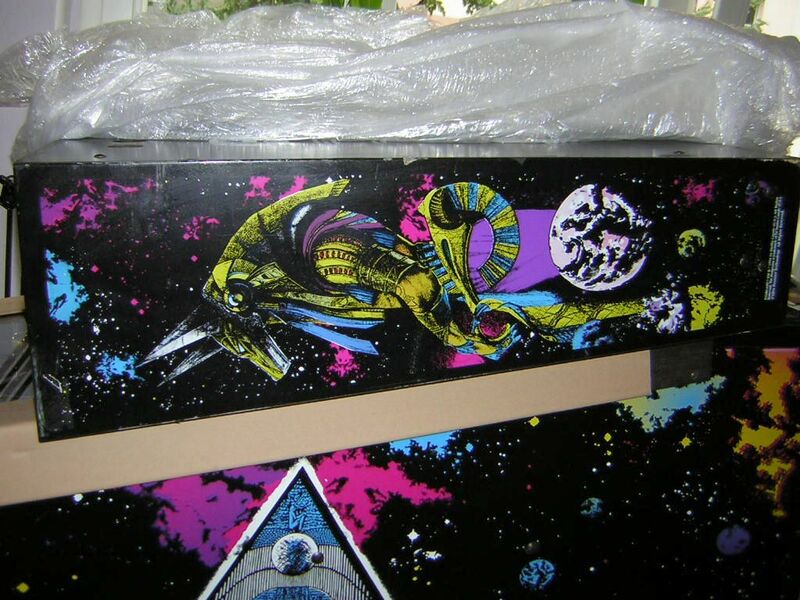 Since Stargate is the first pinball machine I bought for a high price because of its condition, it's the first game I don't have to clean or even wax because all of this was done before. The only thing I needed to do so far was clean and readjust the contact under the ball shooter lane. One thing I did was clean the flippers because they were dirty as hell, and I also wanted to replace the blue rubbers with new black ones. 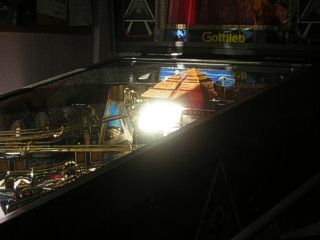 The first problem was that Gottlieb's flippers are not blank, they have a margin in the upper half which is there to hold the original Gottlieb flipper rubbers in place. Normal rubbers used for Williams and Bally games (and all others if I'm correct) are quite wider than what the margin allows, so the blue rubbers were simply pulled over the margin and they worked. When I removed them and tried the same with the black rubbers, not a single ramp shot was any longer possible! I noticed that there was too much rebound space between the rubber and the flipper due to the margin. The solution was to cut down the rubbers to the width that the Gottlieb rubbers have, and now three new black Williams-type rubbers sit firmly on the Gottlieb flippers with-out any rebound between them. Ramp shots aren't a problem anymore (well, if you can manage them!). When I cleaned the flippers, I couldn't leave the upper side of the flippers as dirty as they were, but once I started rubbing away with isopropanol (nothing else gets the dirt from flippers, believe me), I noticed how quickly the black paint on the Gottlieb logo came down with the dirt! I thought for a moment and decided that I wanted clean flippers, so I was left with the choice to either repaint the letters or leave them as they were, plain white so that you would only see them in the relief they shaped on the flippers. After I was done cleaning, I noticed that I liked the white letters much better, so I left them like that. I prefer white flippers with black rubbers over black text any day. I think writing a full Gottlieb logo on them is a little too much self-advertising anyway; Williams flippers have a simple W relief on them which marks them as Williams, yet doesn't scream at you. Right now I like Stargate's flippers as they are, plain white and clean with recognizable letters that can still be missed. Technically the only thing I need to do is replace the nylon flipper bushings because the flippers are very low above the playfield and almost touch it. If they continue to work like this, they might very well do so in a few months and that would ruin the paint on the play-field! 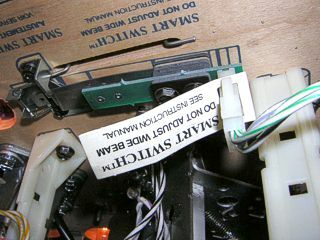 Therefore I will order new ones and rebuild the flipper assemblies with them. Update, 18th July 2005: I was able to get some of the stains and scratches on the backglass translite and the display/speaker panel away by drawing black paint on the spots. You cannot see any of this on the speaker panel since it's put in front of a black plastic back-ground anyway, and while the backglass still needs some refinery, it looks much better already now. 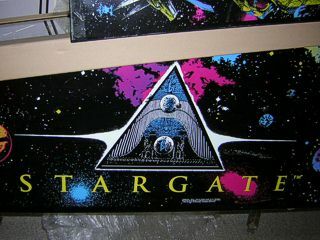 Since I'm currently retouching my STTNG, I will refine the touch-up on the backglass of Stargate tomorrow. Also, there was a common problem with the bank of two drop targets on the center left of the playfield; they wouldn't always reset after being knocked down or even at the start of a new ball. I read here that the coil used to reset the drop targets is quite weak and therefore any mechanical resistance in the assembly might cause this malfunction. I tried to disassemble the drop targets, but somehow all the screws sit so tight that I cannot unscrew them without breaking something, so I just cleaned the targets themselves from the installed position and I also oiled the shaft that holds the resetting metal in place. 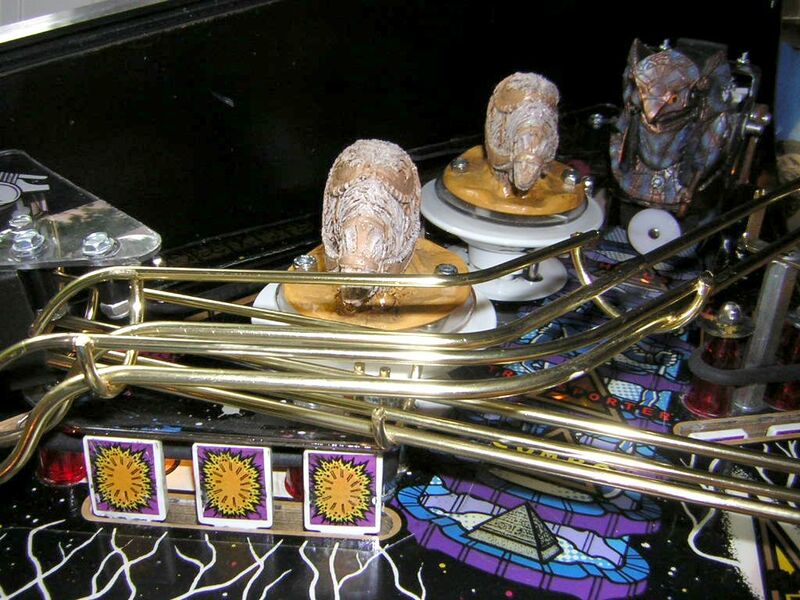 Now, oiling a pinball machine is rarely required and you should not do it with any mechanical parts that don't absolutely require it, especially not coil plungers and sleeves! Oil can become a problem in these. But in this case I tried to remove the resistance that occurred from metal moving on metal when the coil resets the drop targets, and it worked - the drop targets are now being reset without problems. I did have to adjust one of the two leaf switch contacts though since one of the targets wasn't always recognized when dropped - it's funny since Williams used optos for drop targets already in the early 80s and you would expect that a modern Gottlieb machine with smart switches and that stuff would use a better means than standard leaf switches for drop targets! These switches can become a problem either because of dirt or misadjustment. As I said earlier, the ball shooter lane switch didn't make full contact until I cleaned it, and even now it executes a signal when I activate the flippers while a ball is waiting in the shooter lane, because of the flipper's vibration that moves the switch. The same problem appeared after a few games on the Sarcophagus which is run by an equal contact, and that one too had problems recognizing the ball occasionally until I cleaned and readjusted it. So here it is and I can say with conviction that I'm a fan! Watching the movie Stargate one week before this beauty arrived showed me that I was indeed buying the right game since I like the film and its mixture of action, mystery and comedy. It's really not the best flick in the world, but it's a good one (I'm glad that the game is not based on Stargate SG-1 because that would mean watching yet another series!). 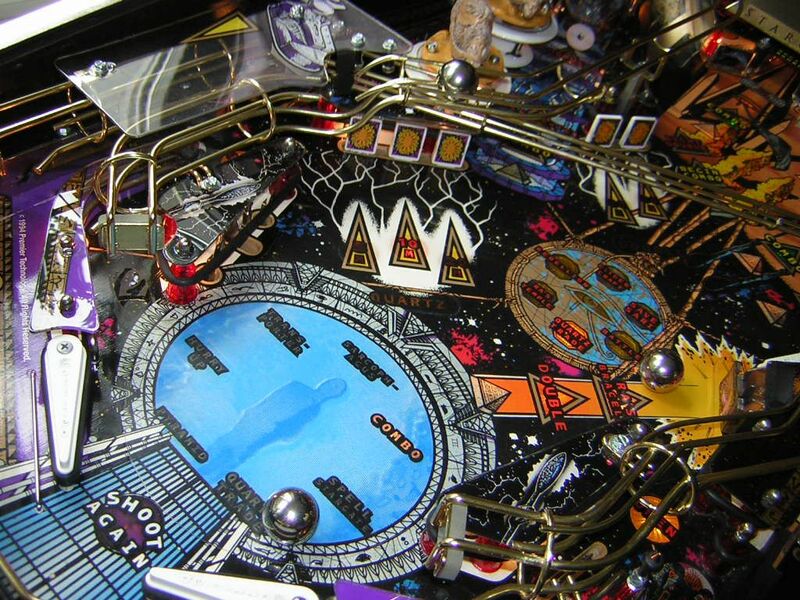 The pinball machine Stargate does the movie justice, it includes lots of references in gameplay, visuals and audio (most especially speech). It might be that a Williams game could have been a little more spectacular (when it comes to the wizard modes, except for the nice light show there isn't much to go "wow" about), however I think that the detail put into the design of the playfield and some great gameplay ideas just make up for that. Stargate is certainly different from other famous pinball games and it's a good addition to my small collection which will probably stay a while if not forever, and I say that with a lot more conviction than I did when I talked about Ter-minator 2 or System 11 games! 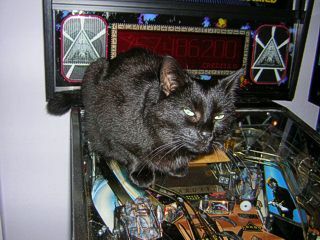 Really, if I wanted even more complex game-play, I wouldn't have a chance to go anywhere with pinball since STTNG and Stargate are among the most complex machines you can find. * I still want some others which might have their strengths elsewhere (for example, No Fear is just a damn cool game with a lot of speed and action), but I'd never trade Stargate (or STTNG for that matter) for one of the games I have on my list unless it becomes unbearably boring. And I bet that as long as this baby runs, I will always find time to come back to play - if not for the wizard modes or the big points, then for the blast of four balls being kicked around and to be screamed at to shoot the pyramid! *Update, 26th September 2005: It seems that I was kind of wrong about this claim when I wrote the article in my euphoria about Stargate. In fact, this machine isn't all that complex and not very difficult to begin with. Whereas I wrote that I wouldn't get tired of the gameplay although it's a little easier than expected, this is no longer true - I find myself playing a lot more with STTNG which is similarly complex and not extremely difficult either, but it has one thing that Stargate is missing - flow. 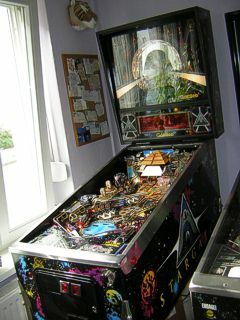 Stargate is a bumpy pin with lots of kickers and if you play it the first time and a while after that, you are excited a lot about the action. Two wizard modes are a lot to go for, but they don't make a game. What breaks the game for me after three months is that this bumpy action is not comparable to a good flow that comes from loops, ramps and shots that feed each other. STTNG has a great flow and if I don't play it for the rules, I play it for the flow. And then it's far easier to reach the Stargate wizard mode than The Final Frontier on STTNG: just play, you'll hit the necessary targets and combos as you go! I've had countless games where I got six of seven required symbols, and often enough I got the seventh if I just aimed right. Getting Eye of Ra is more difficult, but starting missions and letting the multiballs drain is a quick way to reach it. In short, Stargate is too easy for a player like me who seeks flow and difficulty above the normal level. Stargate is very beautiful and a blast to play, but it is not the third of the three "perfect" pinball games I want to have in line in my room. I'm going to sell the machine soon and I will see it leave with a bleeding heart because I know how beautiful and rare it is. I certainly won't sell it to anyone who doesn't appreciate its beauty. But I need to move on and get the next game I really want. Again, if I had money and space, Stargate would stay as a game for the "second line". It's actually too good not to play it. You can't live without the Internet Pinball Database if you're looking for information and pictures of any pinball machine! I recorded a short demonstration game that includes multiball, modes and of course the unavoidable Glidercraft mode. The MP3 can be found here.